Oregon Democrat Kate Brown, who is bisexual, made history on Election Day by becoming the first openly lesbian, gay, bisexual or transgender (LGBT) person to be elected governor anywhere in the U.S. But while a growing number of LGBT politicians have been elected to public office and attitudes toward the LGBT community have become much more favorable over the past decade, survey data suggest that being gay or lesbian remains somewhat of an obstacle for candidates running for president. A majority of Americans (69%) say a candidate’s sexuality would not affect their support of a presidential candidate. But those who say it would have an impact are much more likely to say it would have a negative than a positive one. About a quarter of the public (26%) says it would make them less likely to support the hypothetical candidate, compared with 4% who say it would make them more likely to support that candidate. In terms of perceptions, this ranks among the more negative qualities that a potential president may have, according to a Pew Research Center survey conducted in January. 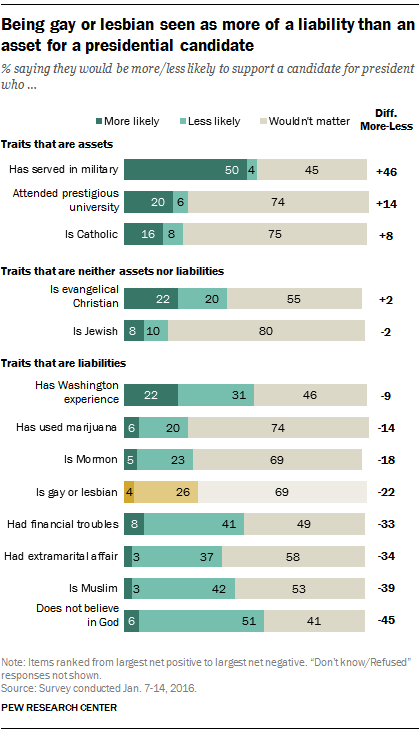 Americans have a higher net likelihood of supporting a candidate who has used marijuana than one who is gay or lesbian, though they are even less likely to support a candidate who has had financial troubles, is Muslim or doesn’t believe in God. Despite these views about candidates running for the nation’s highest office, openly LGBT politicians have won elective office in all 50 states, according to the Gay and Lesbian Victory Fund, a milestone that was reached in 2012. And while Brown is the first openly LGBT person to be elected governor, she is not the first to serve as governor. Jim McGreevey, the Democratic former governor of New Jersey, came out as gay while he was in office in 2004. Indeed, Brown herself has been Oregon’s governor since 2015, when she took over for former Gov. John Kitzhaber, who resigned. The first openly LGBT person to be elected to any public office in the U.S. was Kathy Kozachenko, who was elected to the Ann Arbor, Michigan, City Council in 1974. Several more LGBT politicians were elected soon after at the local and state levels. At the federal level, Tammy Baldwin of Wisconsin made history twice when she became the first person to be openly gay at the time they were first elected to each chamber of Congress: first in the House of Representatives in 1998 and later in the Senate in 2012. No openly transgender politicians have served in national office, though they have served at the local level. Kim Coco Iwamoto became the first openly transgender person elected to a statewide office in 2006, serving on Hawaii’s state Board of Education. Though representation in political office has been increasing, the LGBT population remains underrepresented. For example, 1% of the current Congress is openly LGBT, while estimates show that about 3.5% of the U.S. adult population identifies as LGBT. Correction: A previous version of this post misstated the share of current members of Congress who are openly LGBT. It is 1%.